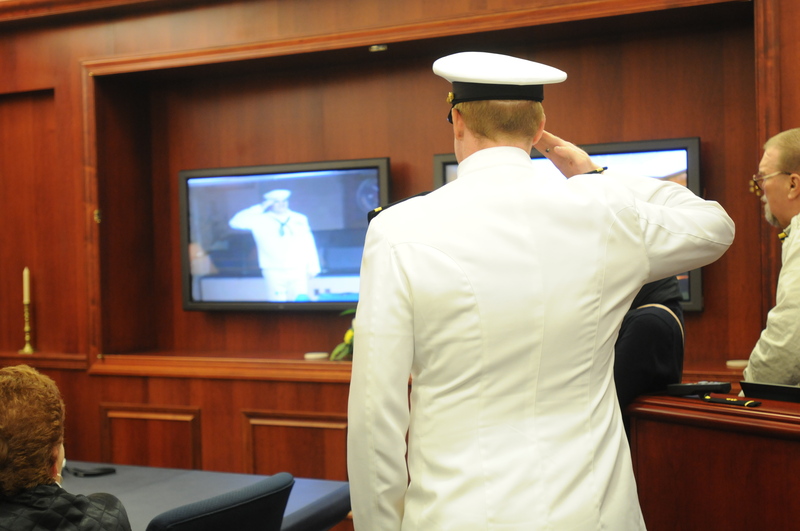 Newly commissioned officers often share their first salute with close friends or family members who have served before them, so it’s not remarkable that Ensign Andrew Wondolowski, who graduated from the Naval Academy on Friday, received his first salute from his brother. What is remarkable is that the salute came from over 7,000 miles away, where Machinist’s Mate 2nd Class Philip Wondolowski is deployed on the carrier Dwight D. Eisenhower in 5th Fleet. The tradition of a first salute from a newly commissioned officer dates back to the 19th century, the release said. An ensign presents a silver dollar to the recipient of his first salute. The tradition goes that the officer must buy his first salute, but he must earn every other salute during his career. The ensign has a 1930s silver dollar that he will give his brother when the Eisenhower returns from deployment later this summer, the release said. The elder Wondolowski joined the Navy in 2005, and Ensign Wondolowski said it was his brother’s influence that inspired him to attend the Naval Academy. “Watching my brother get to experience the Navy as an enlisted sailor and meeting his friends- that’s what really made me want to join the Navy too,” the recent grad said. Ensign Wondolowski service selected the surface warfare community, nuclear option. His first assignment will be to the amphibious assault ship Makin Island.